Easter is a time of reflection for when I give thanks and review my world. I wrote this article over a decade ago and I am learning from each horse (and most humans) in my life. The humans who belonged to these horses are still friends and I thank them for allowing me into their special ‘horse space’. I will add the caveat that these were my experiences and reflections and are quite personal at the time. This Easter’s gratitude is for accepting that I do not know everything – Each horse/human interaction brings its own unique dynamic and sometimes my contribution brings a sudden change while other times I may only be one aspect of what is needed. The one thing guaranteed is that I learn something – sometimes I gain a huge realisation, other times a simple interaction may add to an ongoing life lesson. I haven’t edited this article as it also contains some fond memories, and I invite you to revisit them with me. What I Am Learning …..
We often discuss what we do with horses, how we ride or train them and what we can do for them. But how many of us realize what our horses have taught us? The more I work with horses the more I discover about myself. Sometimes they teach me a way they like to be massaged, sometimes they guide me to where they are hurting, other times they show me how I can let go of judgement and criticism, learn acceptance, to see my own limitations and to understand what it is to love unconditionally. Angus was a police horse that had been carried 60 meters on the front of a stolen car before he fell to the ground. I volunteered to massage him while he recovered. That was the beginning of my four-year journey with Angus. The life of a police horse is not an easy one. Living in the city, patrolling on asphalt roads, performing in musical rides. Angus was a favorite amongst the officers and often gave beyond what was acceptable. He just kept giving whenever asked. One of the most valuable gifts Angus gave me was to be able to discern how I judged people. He was pleasant to everyone, and accepted everyone in whatever space they were in. I could turn up feeling sad or happy and he would simply respond to whatever space I was in and just allow me to work through whatever my issue was for the day. Caleb is a pony Arab stallion. 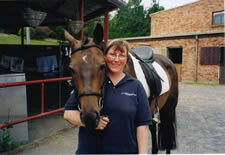 He is also the horse I learnt to canter on again in my adult life. He taught me the value of balance – balance of the mind as well as the body. If I was too extreme in any emotion he would soon level me out, or I had a dreadful ride. If my body was not riding evenly it would reflect in his body when I gave him a thank you massage after his ride. He displayed balance in both his body and mind. He would respond intelligently to all of my requests; he was always responsive. He never over-reacted to an incorrect aid or when I was massaging him and I found a sore place, his response was always polite and he never over reacted or suppressed his response. Interestingly, if I was allowing unreasonable emotions to govern a situation in my life, my canter was often off balance when I rode on this horse. When I find my emotions are displaying an over reaction, I can reflect on Caleb, and often just bringing him into my awareness helps me to regain a balanced approach to any problem. Cinta was a grey mare, breed and history unknown and quite possibly from an abused life before finding her way to the stables I massaged at regularly to practice my skills as my business was building up. Cinta was the charge of a teenage girl. 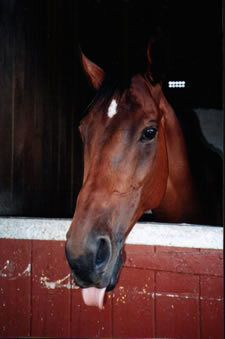 She would come to the stables to unleash her frustrations from her final years of high school, and unfortunately Cinta was the ‘object’ for this release. She was ridden frantically and in an unsafe manner, she would be slapped harshly if she moved when being braided and she had to weather the moods and whims of a teenager prone to temper tantrums. Through all of this Cinta remained steadfast. She showed to me an inner strength that remained solid. It was as if no matter what happened to her, past or present, she knew herself and what her life was all about. When I feel life gets all too much for me, Cinta’s memory recalls, reminding me that I am strong enough to withstand any adversity I may ever meet in life. It reminds me to have faith in myself and to just keep on going as “this too will pass”. You will be pleased to know Cinta’s human grew up and developed into a horsewoman in her own right. Spring was an adorable and sensitive thoroughbred gelding not long off the track. His owner arrived at a training clinic with him as my loan horse, and I was nervous. Not only was I to ride a horse I had not ridden before, but I was to do it in front of almost fifty auditors. The clinic was to teach the rider to recognize the offer and to learn to feel when a horse was giving or in a space to be able to give. Spring gave me the opportunity to improve my timing. Not only in my riding, but in my everyday life. He showed me when I got anxious, all that would happen would be that we walked backwards. When I became focused on my goals, there was no faulting my forward motion. He taught me how my emotions have substance and how if they get out of control they can create obstacles in my life. If life gets that roller-coaster feeling, I think of my weekend with Spring. I remember how I felt when I was anxious and walking backwards and then I take my memory forward to where, by the end of the clinic, I was riding in an easy collected frame to the applause of the crowd. By recalling this feeling and gift Spring gave me, I then harness that feeling to get my life over the anxieties I perceived to be in my way and I simply overcome them and tackle my new challenge. 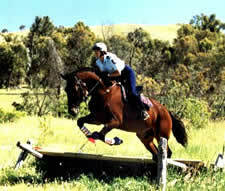 Skeeta was a thoroughbred gelding who had spent several years going around the show-jumping circuit. A regular client who was preparing him for the owner to sell called me out to massage him. He had a valuable lesson for me on this day. Often as therapists we want to help someone or a horse and we sympathize with them, and when we do this we are not always detached emotionally. It is preferable that we feel empathy for our ‘client’. By sympathizing we often take on the pain the animal is feeling and this day I was wide open. As I massaged him the client talked about the life Skeeta had had. It was alarming and as she described his ‘hard’ life I began to feel pain in my body. Then suddenly as the client mentioned an incident I went in my mind, “oh you poor thing”. Well that opened me up completely and I doubled over with pain in stomach. I had broken the therapist’s golden rule and had not remained in the detached caring role. I managed to finish the massage, excused myself and attempted to drive down the freeway. The pain became so intense I had to pull over to the side of the road while I cleared and healed this horse’s past. Skeeta gave me the opportunity to feel what sort of pain he had experienced and to also understand that I could not help him if I simply took that pain on myself. He helped me realize that the greatest gift I could give anyone when they were in pain was to empathize, but to sympathize was to both our detriments. I suppose every horse I have ridden, massaged or simply observed has offered me more of an understanding of myself. Not only have they given me opportunities to address my own failings or to learn about patterns that sabotage my development in life, they have also given me an opportunity to see myself with qualities I can admire and accept. Red is the first horse I practiced massage techniques on regularly, and he was also the first horse that I trusted enough to get me riding again. No matter what I am wearing, how I am feeling, if my hair has been done or I am just looking like I have slept on the park bench the night before, he is affectionate and accepting of me. Now I can visit and he is always ready to nuzzle or want a scratch. When I have the opportunity to ride him he is always willing to guide me safely around the park. Centennial Park in Sydney can be hazardous often with film crews, tourists, dogs and oh yes, cyclists who forget horses have the right of way in the city. If I want to step up to another stride or movement he makes every attempt to teach me how I should ask and still does it when I ask the wrong way. Mind you he lets me know if I have given the wrong instruction with a flick of his tail to just give a hint of frustration with me. He has accepted me when I have hated the world and he has accepted me with tears falling down my face. He accepts me if I walk by his stable and just say hi and he accepts me if I come to massage him. He accepts me if I have a treat or if I don’t. Through his acceptance of me, I learnt to accept myself. I believe if my life was void of horses, it would be hollow and without substance. What they have brought to it has enhanced every aspect of my life and they have proven to be my greatest teachers. Sometimes the most challenging horses have taught me the most, and I have to admit to not always being a willing student. Those are interesting observations. I know that one day I will be able to discern them in my interactions with horses too – but I am still working on the level of awareness you need to see clearly. Thank you for sharing your thoughts! Hi Nadja – I have found, even since penning this article, that it is the simple hints that offer the best keys. Relaxing and being open to the subtle interactions works for me, also listening to the ‘human’ who belongs to the horse. if you really listen to them they already know what needs to be done, they just haven’t trusted yet what they have heard themselves. It can be an amazing journey, I expect you will enjoy it.